Our credentialing software integrates with several other modules to make event credentialing a quick, streamlined process, whether you're printing staff, vendor, volunteer, or guest credentials. We'll work with your organization to explore various cost-saving techniques, including in house credential printing. Many customers find that the money saved printing credentials more than covers the cost of the printing equipment within the first year or two. For smaller events, we offer very reasonable equipment rental and support fees and we'll provide ink and card stock at cost. 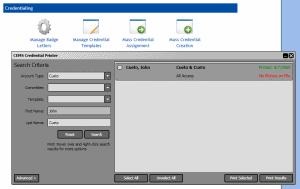 Quickly create, modify, assign and print individual or groups of credentials, on any popular credential printer. Interchangeable web-based and traditional credentialing utilities let you access most features from any computer with a web browser and a wide array of advanced features from any Windows XP or higher computer. 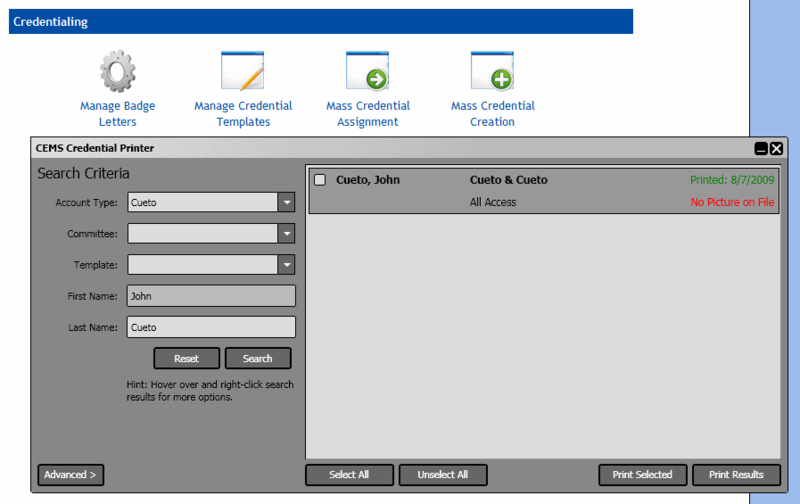 Use an unlimited number of templates to completely customize the credentialing process. Design your own from scratch using multiple methods (including Microsoft's popular XAML specification) or use one of many existing designs. You can incorporate graphics, photographs, text and 3D effects, and multiple ways to show security clearance. Tip! Barcodes: Barcodes allow your organization to make full use of our access control services, including attendance counts, counterfeit detection and setting alerts and denies at scanning locations. Standard credential printers print using full sheets of ribbon, regardless of color variety, and choosing to print barcodes incurs no additional material cost. Tip! Photographs: Limiting photographs greatly speeds up the credentialing process. All-access badges and anyone interacting with players should have photographs. Volunteers, vendors and guests do not need photographs unless they are operating in a high-security area. Check out some samples in our credential gallery. Easy-to-use interface allows vendors and partner organizations to quickly input expected staff and their respective duties and needs. Event staff can approve and modify requests which instantly become part of the credentialing system. A variety of credential materials, based on expected lifetime and exposure, can save an organization a significant amount of money. Badges that need to last a long time or be exposed to rough conditions can be printed on a standard card printer. Temporary and event week-only badges can be printed in groups of four or six on any color laser printer, for less than the cost of one plastic card. The web-based and standard utilities work together to make credentialing quick and easy. Approving requests in the online credential application takes only a few clicks and a few seconds.